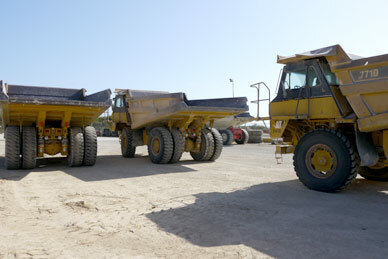 Mijnmaatschappij Curacao (MMC), also known as The Curacao Mining Company), is part of Janssen de Jong Caribbean. The Caribbean division is part of Janssen de Jong group with main offices residing in The Netherlands, where the company was founded. With the discovery of limestone phosphate rock in 1874, the Englishman John Godden, started mining the Tafelberg (Table Mountain) on Curacao. 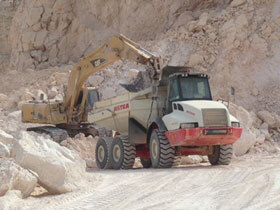 Our main activities are quarrying, crushing and screening which results in the production and sale of various limestone aggregates and sand. We use our own natural harbor for excellent export services, storage and re-ship facilities for MMC clients. MMC processes comply with the highest quality standards. Highly technical and fully automated drilling, blasting, crushing and sieving equipment enable MMC to produce and deliver at international standard levels. MMC anticipated the evolution of the customer’s demands by continuously focusing product quality and added value for the market locally and abroad. The computerized MMC laboratory and capable staff deliver and monitor the production ensuring hardness, granularity and purity. MMC can advise on stone types and fractions, depending on the task at hand. MMC caters to the local market, but in addition has established a name and reputation in the international market with the outstanding selection of production accompanied by excellent and knowledgeable service. At Mijnmaatschappij a small group of people almost literally move mountains. Working in an environment with a relatively small team means that the stakes are high. We must all be accountable and not only understand the company’s core values, but implement them daily in our operations. Mijnmaatschappij is responsible for transforming natural resources using the best technologies available. Resulting in products that meet or exceed the expectations of the consumer in various industries. Ensuring continuity as a profitable company that is constantly taking the environment, the community and the dedicated team of MMC employees into account. Mijnmaatschappij raises the bar within the mining industry, both locally and internationally, with a guaranteed superb quality and control thereof, outstanding service, continuous innovation and investment, efficient productivity and lastly by respecting at all times the environment and the people that live and work within the community in which MMC operates.